The Head of the Ministry of Foreign Affairs of Ukraine Pavlo Klimkin discussed with the UN Secretary General Antonio Guterres in New York the prospects for the introduction of the UN peacekeeping mission in the east of Ukraine,according to the speaker of the Permanent Mission of Ukraine to the United Nations Oleg Nikolenko. 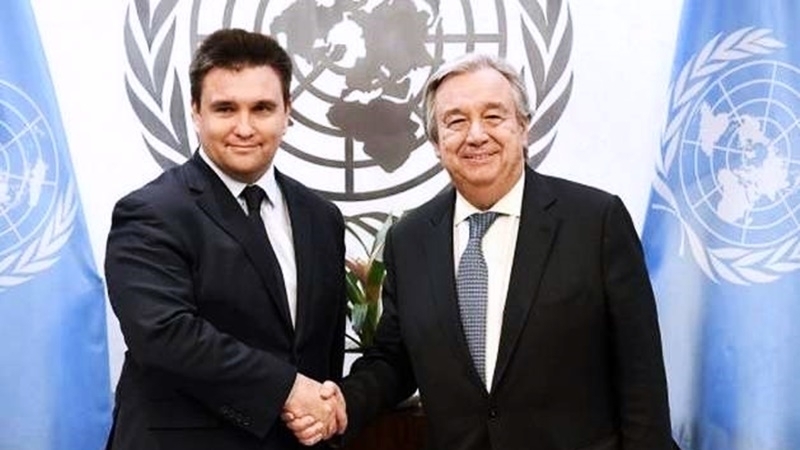 “Pavlo Klimkin discussed with the UN Secretary General Antonio Guterres the prospects for the implementation of the UN peacekeeping mission in the east of Ukraine, the protection of human rights in the temporarily occupied Crimea, cooperation in the humanitarian sphere, including the release of Ukrainian political prisoners and hostages from Russian captivity,” the diplomat reported. He further noted that Klimkin handed over a letter to the UN Secretary General on behalf of the Association of Relatives of Political Prisoners of the Kremlin, human rights and public organizations of Ukraine. Nikolenko also informed that the parties discussed the issue of the release of Ukrinform journalist Roman Sushchenko. Earlier, Pavel Klimkin met with US Secretary of State Rex Tillerson during a meeting of the OSCE Council of Foreign Ministers in Vienna. The parties discussed the issue of deployment of UN peacekeepers in the Donbas.